The owner of a 5-month-old tiger cub found wandering the streets of a Texas town was able to see her Monday, CNN reports. CONROE, Texas -- The owner of a 5-month-old tiger cub found wandering the streets of a Texas town was able to see her Monday, CNN reports. Cody Tibbitts says the animal - a young female that weighs about 100 pounds - escaped while he was moving her from his 13-acre property after it flooded. He's only had her for about a month. Tibbitts says he took her from someone else because she was being neglected. 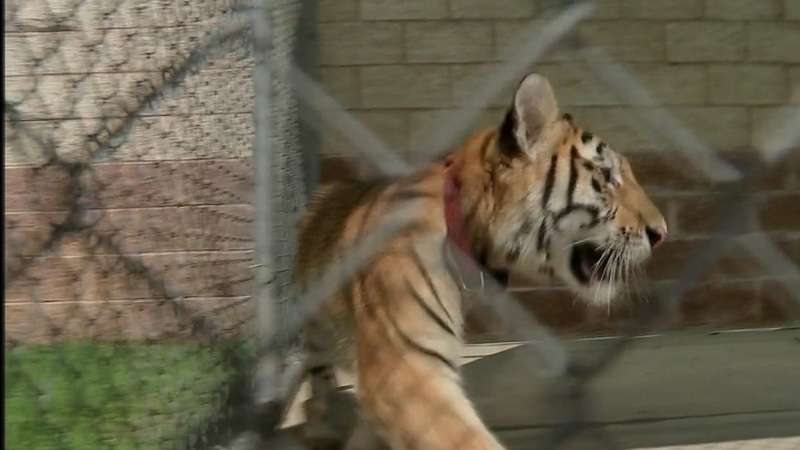 The young tiger was found walking the streets of Conroe last week, wearing a collar and a leash. She's been at the local animal shelter ever since. Tibbitts says he'd like to have her back, but a judge will have to make that decision. If he can't, Tibbitts says he wants to donate her to a shelter designed especially for big cats. "I would love for her to be able to -- it's a place called Tiger Creek. I would love for her to go to a place called Tiger Creek. It's up in Tyler, Texas. And that's my suggestion on where she goes because there's a great -- there's a great program there that she can go to, because ... I just want the best for her," Tibbitts said. Tiger Creek Wildlife Refuge is a 150-acre preserve that is home to 40 rescued big cats. It works to educate people about the animals and is open to the public.